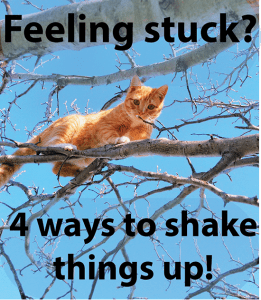 4 ways to shake things up! Have you ever had a week or maybe even longer when things feel off and you’re not sure why? You feel bored, frustrated or dissatisfied with how things are going. You want things to be different, but despite spending hours thinking about it, the way forward isn’t clear. When this happens, it’s easy to fall into the trap of being extra hard on yourself. You chastise yourself for not having all the answers and being able to whip up and execute the perfect action plan. This can trigger more self-doubt and second-guessing. The result? Your confidence takes a nosedive, progress eludes you and you’re stuck in this self-defeating mind muck. If you’ve ever felt this way, you’re not alone. I’ve been there, too – along with most people. 66% of Americans feel stuck in a rut in their personal or professional lives according to a recent survey (GoDaddy). But here’s the good news: feeling stuck is a signal that you’re meant for more! You’ve outgrown something in your current situation and it’s time to take on new challenges. But how do you shake things up and get unstuck? Here are 4 tips that can boost your creativity, increase your personal power and help you take action. Give yourself a break. Beating yourself up because you don’t have an immediate solution can shut you down. Amp up the self compassion and change your inner dialogue. Instead of focusing on your perceived shortcomings, make a list of your skills, strengths and accomplishments. This will heighten your confidence and bring new energy to figuring out your next step and taking it. Take a step back. As stress builds up, your brain shuts down. It’s hard to think creatively when you’re mired in a negative thought pattern that magnifies what isn’t working and all the reasons why you can’t get clear and get going. Identify the facts of your circumstances versus the stories you may be spinning that aren’t actually true. This can relieve anxiety, increase clarity and help simplify what was feeling overwhelming. Try something new. Have some fun with this! Science says our creativity and problem solving abilities are amplified when we try new things. Watch a TED talk on a subject you know nothing about. Listen to new music. Explore a different route on your next walk. Go to a Meetup or an event that piques your curiosity. Take a new exercise class. Changing things up sparks fresh ideas and insights that can broaden your perspective. Address what’s most dissatisfying first. What’s stressing you out the most? Pinpoint what this is and take immediate action to resolve it. 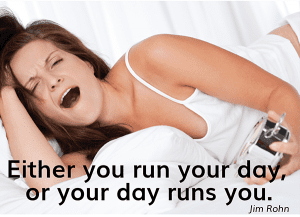 Exhausted from overworking? Ask for help or say no to something. Resentful because someone is crossing your boundaries? Have that conversation you’ve been avoiding. By taking action – even a small step – you reclaim your power and heighten your risk taking ability. Let’s face it. Change isn’t easy. But the strength and resilience you gain through the process will empower you to think and act with new perception. So the next time change comes knocking on your door (as it inevitably will), greet it as a teacher who has come to spur you on to greater heights. 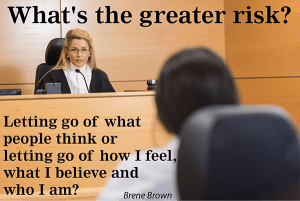 Do you worry that people will judge you? A few weeks ago, a reader shared a challenge that most of us grapple with at some point. You have great ideas, something you want to say and a unique perspective to share. But when it comes time to speak up, especially in high stakes situations (meetings with senior management, important negotiations or difficult conversations with family or friends), your nerves kick in and hijack your brain. All of a sudden, it’s hard to find the right words, remember the point you want to make or perhaps, to speak up at all. Early in my career when I was a rookie junior account executive at an ad agency in New York, I was beyond excited when I was sent to cover my first photo shoot. My agency was creating an ad campaign for a client who was sponsoring a major women’s golf tournament. One of the shots featured a smiling female golfer, club in hand, poised to strike the ball. But as the photographer snapped away, I noticed that something looked off to me. The right-handed model was wearing a golf glove on her right hand. I didn’t know that much about golf, but I was pretty sure the glove was supposed to be on her left hand. Should I say something? It felt risky. I’d only be on the job a few weeks and I was worried about making a mistake. Since I didn’t totally trust my golf knowledge, I called someone (who later became my husband) who was an expert at the game. He confirmed that a right-handed golfer would definitely wear the glove on her left hand. With my legs shaking, I approached my boss and told him the news. He wasn’t happy about the extra time and expense involved, but the correct glove was produced and the pictures were re-shot. Why was it so difficult for me to speak up? The truth is, I was afraid of how other people would judge me. And my mind had quickly catastrophized the situation and the possible negative outcomes. I told myself: everyone here is more senior and knows more than I do – who am to say something? What if I’m wrong and my boss gets mad that I made the agency look bad in front of the client? What if I’m right and the client is angry because the pictures have to be re-shot? I could jeopardize a multi-million dollar account – and maybe even my job. If you’ve ever found yourself feeling hesitant to speak up, here are 12 practical tips to help you harness your nervous energy so you can speak your mind. The confidence to speak up is like a muscle. It gets stronger and more powerful with exercise. 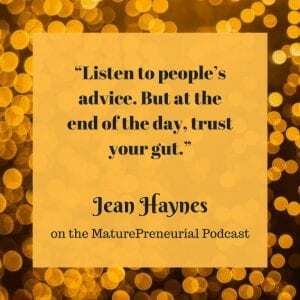 I had a lot of fun hanging out with Elaine Benoit on her Maturepreneurial Podcast. I shared successes, missteps and lessons learned (lots of them!) from starting my business. To learn more about Elaine, click here. Who’s calling the shots – you or your inner cavewoman? Have you ever had a performance review where you got glowing remarks in 24 out of 25 categories, and one “area for improvement”? What did you focus on? If you’re like most women (including me), it was that ONE thing …. The truth is, our brains are hard-wired for negativity. Scientists call it negativity bias. It’s a fact of human evolution. There’s a primitive part of the brain called the lizard brain that jumps into action to protect us when it perceives a potential threat. This triggers the fight/flight response, which was a matter of life or death for our ancestors. They needed to take down that saber-toothed tiger or run like crazy to get back to the safety of the cave in order to survive. While we don’t usually face that kind of physical threat today, our brains are still on high alert, guarding us against potential threats. When we think about trying something new or stepping into a leadership role where we risk criticism, disappointment, rejection or failure, our brains register this as DANGER and work overtime trying to keep us safe. It sounds counterintuitive, but critical self talk is often the way our minds try to protect us. Thoughts like: “You’re not ready. You don’t have the right experience. And anyway, who do you think you are?” have us second guessing ourselves and keep us playing safe and small. So how do you keep your negativity bias in check so you can take the smart, strategic risks that lead to big wins in work and life? Here are three tips that can keep you moving forward when your pesky inner critic tries to keep you safely stuck in place. Recognize that your thoughts aren’t the problem. Negative thoughts are going to pop into your brain – that’s normal. Please don’t beat yourself up when this happens – your brain is doing what nature designed it to do! 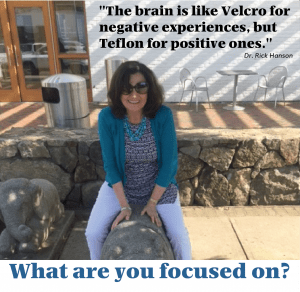 The key is to notice what’s happening and name it: “Oh, that’s my lizard brain trying to keep me safe.” Now that you understand what’s happening and why, you can defuse the power of your negative thoughts and choose to respond differently. Practice self-compassion. We are so hard on ourselves! And compassion doesn’t just feel good, it’s usually the more honest response. Because what we’re normally telling ourselves, courtesy of our lizard brains, is a lie. If you say to yourself after a setback, “I can’t believe I just did that. I’m such a screw-up”, that’s not the truth of who you are and what you’re capable of achieving. Instead, speak to yourself the way you’d talk to a dear friend – with kindness. Shift the focus to what you learned and how that will help you in the future, instead of wallowing in harsh self-criticism that shuts you down. Own your real value. Many women don’t fully appreciate the value they bring and diminish themselves and their accomplishments. Instead of replaying those moments when things went wrong and you made a mistake or didn’t speak up, what about all the times things went well? Times when you solved a tough problem, came up with a creative idea, or handled a difficult conversation? Challenge the default assumptions and beliefs you’ve been carrying around, and own the truth of who you are and all the skill, talent and experience that you bring. Don’t let your cavewoman brain keep you from creating the career and life you really want. You’re capable of so much more than you think you are! Are you in the 33% or the 67%? Overall, I love what I do. But I didn’t always feel this way. My first job was in finance – definitely not the ideal fit for this English major. My boss was a bully and I spent my days (and often my nights) crunching numbers, worrying about their accuracy and constantly hustling to meet tight deadlines. I felt stressed out, overwhelmed and unhappy. How about you – are you excited and energized about how you’re spending your day? I hope you’re part of the 33% and love what you do. But if you find yourself rationalizing that you should settle for what you have, or telling yourself you’re too busy to proactively design your career path or feeling stuck in a toxic situation, these are signs it’s time to change things up. The first step to achieving greater satisfaction from your work – and life – is to increase your awareness of where you are right now. Here’s a simple (but revealing) exercise that can help you pinpoint areas where making some changes can significantly increase your happiness. Track: Record how you’re spending your time each day for a week (even 3-4 days will give you some helpful insights). Be sure to note how you feel when you’re doing each activity. And keep it simple – use your calendar, a journal, your phone – whatever is easiest for you. Reflect: At the end of the day (or first thing in the morning if you’re an early bird like me), review your activity log. Highlight the areas where you felt most engaged, challenged and excited. 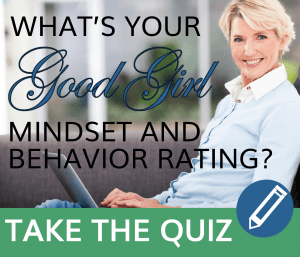 What do your results look like – any surprises? Act: Now that you have more clarity on what lights you up, your challenge is to add more of it to your day. When I identified speaking as a focus area, I talked with my boss, offered to do an internal training and raised my hand to speak at industry conferences. Over time, this became a bigger part of my job, expanded my career opportunities and led me to start my own business. If you discovered that you’re spending the majority of your time doing things you don’t like to do, it’s time to ask yourself why. You have skills, talents and a “secret sauce” that will make you a standout in the right environment. So don’t settle. You deserve more. Last week I got a chance to watch a flotilla of sailboats racing into the harbor with their colorful spinnakers unfurled – what a pretty sight! While the boats painted a lovely picture for me, I suspect that things didn’t look quite so rosy to the young sailors out on the water. They’d had to nimbly adjust to shifting weather conditions – darkening skies, choppy surf and cold rain. Not exactly smooth sailing! Sometimes our plans don’t work out the way we expect them to and we’re challenged to course correct, too. Case in point: an entrepreneur I’m coaching (I’ll call her Jane) said she was feeling discouraged and frustrated because her business isn’t growing the way she expected it to, especially given all the time, effort and energy she’s pouring into it. She was even flirting with the idea of getting a J-O-B instead of pursuing her business – which she’s incredibly passionate about. Things had definitely drifted off course! We talked through the situation to get to the heart of the problem. Here are 5 strategies that helped Jane shift her perspective, take action – and get results. (Put them in your toolbox and use them the next time you’re feeling stuck and need to get back on track). Get calm. It’s hard to make your best decisions when your mind is racing and conjuring up all kinds of worst case scenarios. Jane felt overwhelmed and exhausted because she was so anxious about her business. Her first step was to calm her mind so she could think more clearly. For her, taking time to breathe, meditate and exercise did the trick. Find the facts. Are things really as bad as they feel? Emotions can cloud your vision, making the situation look far worse than it really is. Give yourself a reality check. When Jane looked at where she was actually spending her time, it was an eye opener! Facebook and email were time bandits that diverted her energy and cut into her productivity. She took back that time to focus on her priorities. Don’t reinvent the wheel. Jane had created several high impact programs and tools for her clients. And because she’s so good at this, it became her go to strategy for business development (time consuming and draining!) But a lack of offerings wasn’t the problem. Now she’s putting her energy towards marketing her existing programs more strategically and effectively instead. Adjust your attitude. Your mindset is critical. How you think affects how you feel. Your emotions trigger your actions which then lead to your results. When you think you can’t do something, it’s natural to feel disheartened. Acknowledge your feelings. But don’t wallow in them – it will keep you stuck! To turn this around, remember why you’re doing the work you do. Shift the focus to your clients, customers and colleagues and the difference you want to make. Take action. Once she felt calmer and more focused, we brainstormed immediate action steps Jane could take to grow her business. And I applaud the energy with which she implemented them! Her results speak for themselves: in less than a week, she landed a new client, scheduled a meeting with a prospective client and saw a spike in sales of her book. Jane’s openness to changing what wasn’t working so she could achieve a different outcome inspired me to make a few tweaks in my business. Is there an attitude or approach you could shift to get more of what you want from your work or life? Surround yourself with people who inspire and empower you! 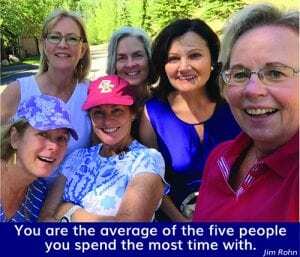 A few weeks ago, I flew to Utah to spend the weekend with 5 classmates from my Catholic girls high school. It’s been years (okay, decades) since we donned white dresses and received our diplomas, excited to head off to college and new adventures. Though I’d kept in sporadic touch with some of my classmates over the years, the truth is that careers, kids and life took us in different directions. What would it be like to hang out together again? It was a blast! We talked for hours, looked at old pictures and shared lots of laughs. There was a level of trust, respect and acceptance that made conversation and confidences flow easily as we shared our stories and hopes for the future. It reminded me that who you spend time with can definitely influence your behavior, happiness and success. Most of us have experienced a friend, relative or co-worker who radiates negativity – constantly complaining, tearing other people down or focusing on what’s not working. A few minutes with one of these energy vampires can leave you feeling drained and out of sorts. There’s even a term for it – emotional contagion – because you absorb their energy and emotions. But here’s the good news: when you spend time with people who are happy, motivated and genuinely supportive of others, you mirror these emotions, too. So what qualities do you look for in your most trusted friends and colleagues? Here’s my list, inspired by spending time with my smart, accomplished (and did I mention fun?) classmates. Remember, your time is precious. Spend it wisely with people who challenge, support and inspire you to be your best (and do the same for them). 3 tips to get more done! Morning already? I need more sleep! And then the debate begins: should I hit the snooze button or get out of bed right away? The good girl in me wins and a minute later, I’m brushing my teeth. I glance in the bathroom mirror and – OMG, look at those circles under my eyes! I have to get more rest. But I’m always so busy…. Then it’s on to my closet, where I grab the suit I plan to wear. As I’m putting the pants on I realize the button is missing. Damn! I don’t have time to sew it back on. So I riffle through my closet looking for something else to wear (hoping it’s clean and fits!) All the while, my mind is racing through my to-do list which has more items on it than there are hours in the day. How can I possibly do it all? That used to be a fairly typical start to my day – and it was only the first 5 minutes! My brain was already in stress mode with a million thoughts bouncing around and my day spiraled into a crazy busy whirlwind from there. Here’s the truth: when you begin your day feeling stressed-out, over-extended and exhausted, you can’t show up and perform at your best. Breathe. According to stress expert Dr. Heidi Hana, if you spend 2-3 minutes focusing on your breath, you can dramatically change the physiology in your body. So before stress hijacks your day, close your eyes, take a deep breath and exhale (repeat 3 times). This triggers over 1400 chemical reactions in your body that recharge your energy, lower your blood pressure and focus your brain. Trim your to do list. What are you doing out of sense of obligation or guilt, not because you really want to do it? (hint: look for places where you’re saying “should” or “have to”). Review your list and eliminate what isn’t critical. Yes – you have permission to stop doing things that aren’t essential, strategic or making you happy! Ask for help. Have you bought into the myth of super woman, believing you have to do everything yourself? Or does the perfectionist in you think no one else can do something as well as you can? Relieve that pressure by asking for help (delegate, barter or pay someone). You’ll reduce your stress and free up time to accomplish your top priorities. My “I do” versus “to do” wake-up call! Last Monday, I was doing homework for a book writing class I’m taking, but I was really struggling to concentrate. 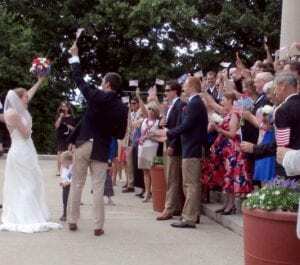 My thoughts were on other things: My son’s upcoming wedding, to be exact! which shoes to wear with my mother-of-the-groom dress, red or silver? A friend checked in to see how I was doing. Me: I have a lot of work to do, but I’m distracted by last-minute planning for the rehearsal dinner and the wedding. Her: Hmmm “distracted” by wedding stuff? Maybe this is where your focus wants to be because your son is about to get married and it’s a super special time. When’s the wedding? Me: The rehearsal is Friday and the wedding is Saturday. Her: This week?!? Sister! It’s ALL about the wedding. I owe my friend a big thank you for this reminder. My priorities were definitely mixed-up! I was stressing myself out feeling I should be working, then fretting because I wasn’t getting much done – even though I’d deliberately lightened my schedule in anticipation of the big day. What a relief (and joy!) to give myself permission to focus on what mattered most: being all-in as the mother-of-the-groom and enjoying the wedding planning and festivities! Let’s face it, life is busy! Most of us consistently face the dilemma of having too much to do and not enough time to get it all done. In the midst of all this busy-ness, it’s easy to lose sight of what’s really important. So if you’re feeling stressed out and time crunched, what is it that you need to give yourself permission to do – or stop doing? Giving your time and energy to what matters most makes you more productive – and a whole lot happier, too! 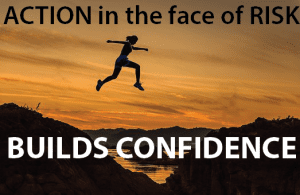 What’s the #1 way to build confidence? Take action – even when the outcome isn’t guaranteed! When you hear the words “risk” and “failure” what’s your fist reaction – to move towards or away from them? Great advice, but how do you deal with the fear of failure that may be keeping you stuck in the first place? Here are three strategies to help you shift how you think about failure so you can amplify your confidence and start taking action now. Acknowledge your attitude. Do you take failure personally and see it as evidence that you’ll never achieve your goals? How is that impacting your confidence and progress? Redefine your view of failure if your current thinking is undermining your belief in yourself and your willingness to take action. Look for the lessons. Think about a few instances where you feel you failed. What did you learn from those experiences? Reflecting on what didn’t work can fuel your resilience and help you grow – personally and professionally. Find the opportunities. 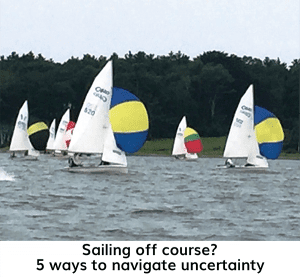 What new insights, ideas and approaches were sparked by the lessons you learned when things didn’t go according to plan? With that knowledge, how can you do things differently to achieve your initial goal? Are there new areas to explore that you didn’t originally see? So the next time fear is threatening to stop you from pursuing your goals, ambitions and dreams, remember: when you view failure as an opportunity to learn, grow and innovate, success is already yours.